“The Best Book Club Ever” February read was, Hotel on the Corner of Bitter and Sweet, by Jamie Ford. Our group met for dinner last night and had a first-rate discussion of the novel. This month since it was my book choice, I was compelled to research the subject of the Japanese Internment Camps since it played a main factor in the book. I felt it was important to discuss the fear which gripped the country after the bombing of Pearl Harbor and the United States entrance into World War II. I also brought along two books of interest, Farewell to Manzanar, by Jeanne Wakatsuki Houston & James D. Houston. It is the true story of a Japanese American family interred at the Manzanar camp. The other book is a children’s book which I read to students, Baseball Saved Us, by Ken Mochizuki. This is a fictional account of how a young boy finds something to look forward to during his time at an internment camp. Interestingly enough I found out the author’s parents were at the Minidoka internment camp in Idaho which is the same camp that one of the main characters, Keiko Okabe, and her family were sent to live. 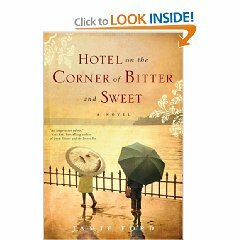 Hotel on the Corner of Bitter and Sweet contains many elements which make it an excellent choice for book clubs to talk about. We were of the same opinion that cultural diversity and prejudices and loyalties were at the heart of Ford’s book. The story is told from the past and the present. It alternates from Henry as a 56-year-old to Henry as a 12-year-old boy living in Seattle at the time of World War II. It revolves around Henry Lee, who is Chinese and his friendship with a Japanese girl, Keiko Okabe. It’s a story of young love and the lengths one will go for it. It was informative as to the pride of the Chinese and how it played an important role in the book. Henry’s relationship with his father was a component of the novel we probably addressed throughout the evening because as the book proceeds to the present, the reader learns of Henry’s relationship with his own son, Marty. Music, in particular, jazz, plays an integral ingredient as well. Henry becomes friends with jazz musician, Sheldon Thomas, which in turn introduces Henry as well as Keiko, to the music of Oscar Holden and the song, “The Alley Cat Strut.” The 78” record of this song we all felt was very symbolic also. The Panama Hotel seemed to be a character in itself throughout the book. Our group felt this is where “the bitter and the sweet” converged from beginning to the end. We all agreed our favorite quote from the book, referring to Henry’s father, was, “His father had said once that the hardest choices in life aren’t between what’s right and wrong but between what’s right and what’s best.” (p. 204) Without giving anything away, we liked it because it too many of us, it was the heart of Hotel on the Corner of Bitter and Sweet. A Worthy Cause: The Inbound Marketing Book Charity Challenge! One of my favorite quotes as a librarian! If you are an avid reader, how important it is to have our own collection of books! I’m sure many of you, like me, when you were growing up, frequented your local public library. How lucky we were and still are to have a local public library, I suppose we take it for granted. On the other hand, there are places where such things just don’t exist. Yesterday, my daughter, Sarah Evans, told me about a cause which she knew I would be quite interested in. It is, “The Inbound Marketing Book Charity Challenge”. In conjunction with the popularity of their new book, Inbound Marketing, authors, Brian Halligan and Dharmesh Shah were inspired by the Room to Read organization. Their mission is to boost literacy throughout the world by delivering books to countries in need. Halligan and Shah would like to raise $12,000.00 to establish three libraries in emergent countries with your help. Here’s what you can do to lend a hand. Please tweet about the article: http://blog.hubspot.com/blog/tabid/6307/bid/5629/The-Inbound-Marketing-Book-Charity-Challenge-Please-RT.aspx and persuade other people to tweet as well. There is also of list of VIP’s at the mentioned site which you are encouraged to request them to tweet about the challenge. The deadline for the challenge is, Midnight Sunday, February 28th, 2010. Are you an educator using the Amazon Kindle at your school or investigating the possible uses of the Amazon Kindle? If you haven’t discovered the Kindle website, Edukindle, a Kindle Educators Group created by Will DeLamater. Will is a former teacher and principal. He first started the blog, and the Ning as a result of his original site. At the site there are forums, blog posts, e-book news, and the ability to connect with educators. As I began to research the possibility of developing a Kindle program for our middle school, DeLamater was an excellent resource person for me! He would always respond promptly to all of my questions. Without his help and expertise our program would not be as successful as it is today. I’m quite excited to say our program will be growing by leaps and bounds for the upcoming school year! Abraham Lincoln: Vampire Hunter, by Seth Grahame-Smith will be released in March. The Highly Effective Detective Plays the Fool, by Richard Yancy will be released in March. Imperfect Birds, by Anne Lamott will be released in April. Stink: Solar System Superhero (Book 5), Megan McDonald will be released in March. I first heard of this book via Twitter. After reading a few reviews I knew this book was one I definitely had to read! Amazon compared it to “Steel Magnolias meets The Help!” That comment sold me as well. 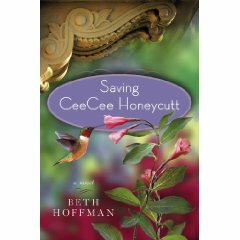 The author, Beth Hoffman, shares a CeeCee Honeycutt’s young life story with us and it’s one you won’t easily forget! You will laugh, cry, and be awestruck by what CeeCee has to endure as young girl of twelve. CeeCee is caring for her mother, Camille, who is mentally unstable and the laughing stock of the town. Her father cannot handle the difficulties Camille’s illness so he is absent much of the time. Just when you think CeeCee can bear no more, her mother is killed by an oncoming truck as she crosses the street. Enter, CeeCee’s great-aunt, Tootie Caldwell, to take her to live with her in Savannah, Georgia. During her summer in Savannah, CeeCee’s life is suddenly transformed for the good. There are many women who enter her life, for one, Tootie’s wise housekeeper, Oletta Jones, who becomes a friend and confidant to CeeCee. She decides early on which of Tootie’s unusual neighbors, Thelma Rae Goodpepper and Violene Hobbs, is trustworthy and enjoyable and which one is prejudicial and unpleasant. CeeCee has lost her mother, but through this loss, gains a wealth of love from some wonderful women! I must say, I laughed until I cried, while I read one particular episode in the book! I won’t give it away but it has to do with a camera and a brassiere –hilarious!!! Thank you Beth Hoffman for sharing a part of CeeCee’s life with us! Today I’d like to feature two books which would be excellent read-alouds for your students or children in grades Kindergarten through 3rd grade. One of my favorite parts of my job as a school librarian is to see the excitement in the eyes of the students as I read to them each week. So many times I’ll tell the students, “this is one of my favorite books,” which they always seem to respond, “Mrs. Parker, they are all your favorite books!” I explain if I didn’t love a book I wouldn’t enjoy reading it over and over again and some books I’ve read aloud for the past 33 years! They must be wonderful book then! Velma Gratch and the Way Cool Butterfly, by Alan Madison and illustrated by Kevin Hawkes, is a delightful read-aloud for children! It is one of this year’s, Illinois Monarch Nominee Books! Velma is the youngest of 3 sisters. When each of her two older sisters was in first grade they both shined in different areas. One excelled at singing and the other one excelled at running. Now that Velma is in first grade, she too wants to be great at something but she goes about it the wrong way at first until she discovers it through a monarch butterfly! The third-grade students whom I read this to enjoyed it tremendously since they had recently learned about butterflies and many of the terms used in the story. It was quite funny how Velma heard and pronounced such words as, “migration” but to her it sounded like, “my-gray-sun! As I child I loved watching Disney’s, “Alice in Wonderland.” I was quite fascinated by the characters Alice meets on her journey. Eventually I read, Alice’s Adventures in Wonderland, by Lewis Carroll. Little did I realize as I read this delightful tale there actually had been a real life Alice whom Lewis Carroll (Charles Dodgson) based his story on. Recently I was fortunate enough to attend Melanie Benjamin’s book signing and launch party in January at Anderson’s Book Shop, in Naperville, IL. Her new novel, Alice I Have Been, is the fictional account of Alice Liddell Hargreaves’s life and her encounter with Charles Dodgson – aka – Lewis Carroll. At Oxford, Alice’s father was the Dean of Christ Church. Alice and her family were friends of Charles Dodgson who was a professor there. Dodgson spent time with Alice and her two sisters and told them many stories. One in particular, Alice asked him to write about. It was of a young girl falling down a rabbit hole. For unknown reasons, the Liddell family abruptly broke off their association with Dodgson. There is no available information concerning what happened. For Benjamin, this was her chance to write what she thinks happened, as she says, Alice I Have Been, is Alice’s story. Benjamin’s words transported me back in time to Alice’s world. She has spun a superb tale. Alice, at the age of 11, wanted Dodgson to write the Alice story because she would then be forever young. Do we all secretly wish the same – our youth? I was brought to tears as Alice, as an older woman, reflected on her life. It made me stop to reflect as well. Alice I Have Been is a treasure waiting to be open and enjoyed! I now am re-reading, Alice’s Adventures in Wonderland to discover a bit of Alice! Coincidentally the new, “Alice in Wonderland,” movie starring Johnny Depp, will be released on March 5, 2010. I think I’ll be seeing it as well! 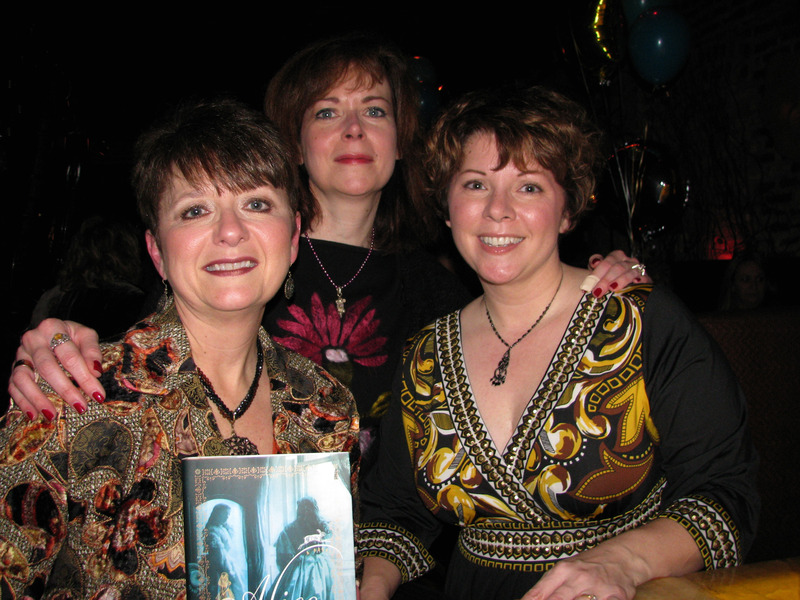 One of my favorite things to do is meet authors. 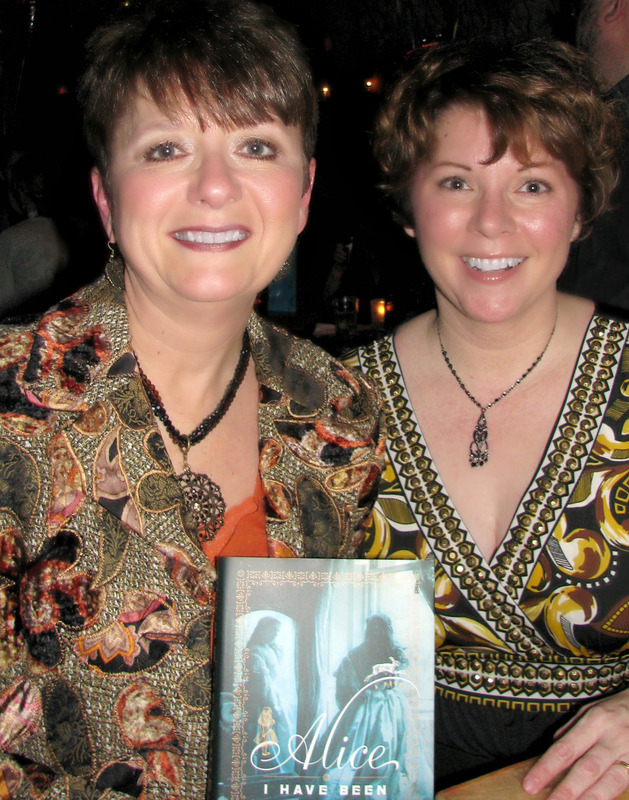 I recently had an opportunity to meet Melanie Benjamin, author, Alice I Have Been. Thank you to Barb Rozgonyi (@wiredprworks) for making this a great experience (and for the pictures)!